American Beech Tree, Fagus grandiflora • by Lesley Bruce SmithIt is hard not to sing the praises of the magnificent American Beech, Fagus grandiflora. It has such an imposing presence and the smooth silver grey bark make it easily recognizable. The winter photo shows the distinctive “needle like” reddish brown buds that were once used as toothpicks. The coppery leaves that often persist into the winter months make it a favorite in the northern climate because it affords four seasons of beauty and interest. The name Beech is similar to book in many languages, in Anglo-Saxon the “tree” was boc and bec meant “book” and indeed slabs of Beech bark were used in early times to write on and were sometimes tied together to create the earliest books. The Latin term Fagus comes from the Greek, phagein which means “to eat”. Most likely, because Beechnuts, although small, are nourishing for humans and livestock. The Iroqouis aboriginal peoples would combine equal volumes of leaves from both the Beech and Linden trees and steam them to create a poultice that was used to treat burns. 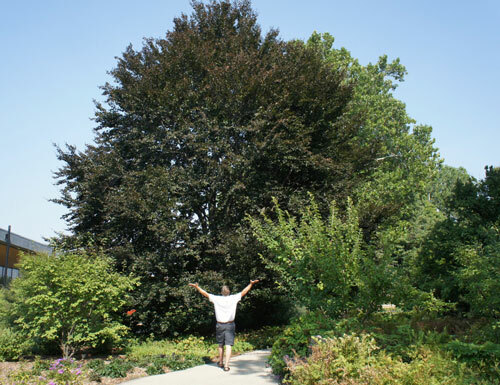 Beech trees need to be carefully placed in the Chicago area if they are to survive and thrive. They demand a loose, well drained soil. This fact is only affirmed as we see Beech trees growing easily in the sandy well drained soils that are so abundant on the opposite side of Lake Michigan less than a hundred miles away. The weather is certainly not the limiting factor here. The heavy clay glaciated soils of the northeastern corner of Illinois are not friendly to the magnificent Beech trees we see growing like weeds in the soils of western Michigan and Door County, Wisconsin where the soils are loose, gravelly, sandy and extremely well drained, yet with plenty of moisture. They also need lots of room, because they will dominate the space provided for them with their magnificent spreading canopy. 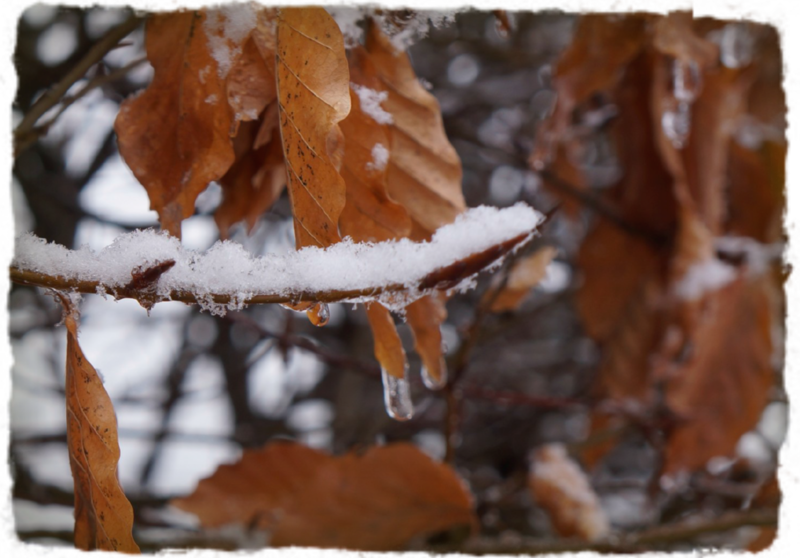 These are all fascinating facts about the Beech tree, but like most of our landscape plants, which have a rich history in ethnobotany, we plant the Beech because of it’s amazing structure and beauty. A silver lining to the cold winter? Have emerald Ash Borers been killed by cold temperatures? There has been a lot of press recently, about tests done in Minnesota indicating that the cold weather may have killed large numbers of the Emerald Ash Borer. This is very good news in the battle against the borer that is killing our Ash trees. So what can we expect to see next summer? Are the Ash going to survive after all? Autumn Ash Tree • photos by Lesley Bruce SmithI’m very sorry to say it, but the answer seems to be, in the long run, no. The state of Michigan lost hundreds of thousands of Ash trees in spite of cold blasts. Tests from Canada indicate that the borer has coping mechanisms for cold. If the polar vortex had occurred earlier in the year when the insects had not yet acclimated to the cold it may have killed more borers. Like us, the borers get hardier as the cold persists, but it is the big fluctuations between warmer sunny winter days and arctic blasts that are killing. In the long run however, because there is no natural population control for the Emerald Ash Borer, their numbers will skyrocket. They multiply by a factor of 10 every year. This means that even if all but one single mating pair were killed, in six years this couple would produce one million of their kind. To complicate matters they do their dirty work under the cover of the bark. By the time we can see them, their populations have often built up so high that too much damage has been done to save the tree. Really if the reports are accurate, and the borer populations have been knocked back, this is good news because nature is giving us a second chance. When the first wave of attack came to our area many tree owners didn’t act to protect their Ash trees until the infestation was out of control. Don’t wait! If you haven’t already, ask your favorite Arborsmith to inspect your landscape to see if you have any Ash trees. The cold may have given us “a time out” in which we can select a few Ash trees and protect them. In 5 years we may not have another chance. I wanted to remind everyone this month that Gilbert and I have been doing business on the North Shore of Chicago for 33 years now, and we have lived here our whole lives. As fifth generation entrepreneurs we have a pretty amazing network of folks that we know who do all kinds of services. I wanted to share a partial list of who they are, so if you find yourself in need of help in an area not having to do with trees, and you are uncertain as to where to turn, don’t hesitate to ask us for a referral. We probably “know somebody!” We have used and know every one of these vendors personally and the list is not complete. Be sure to ask us if you find you have a need, and need a referral you can trust. Effective Air Heating and Cooling, owned by Gil’s brother Jon Smith. Hanson Painting, owner Greg Hanson, Greg is always going the extra mile, has a shop where he can powder coat/paint outdoor furniture to get ready for summer. Cornerstone Painting, owner Jonathan Richards, Jonathan has worked for us several times and is meticulous and exacting, superior work. Lake County Movers, owner Mark Paiser, moved us to our new offices, can’t say enough about Mark’s quality and dependability. The Organic Gardener, Jeanne and Verd Nolan owners, creates beautiful organic edible gardens to nurture your family’s health and well being. Legal Council, especially for litigation, Timothy M Johnston, just the guy you want in your corner no matter the issue, gives free initial consults. Alpha Graphics Printing in Vernon Hills and online, contact Christie Sweatman. General Contractor, BDS Construction, owner Bryan Slowick, Bryan won’t settle for anything less than excellence. Jean MacDonald, Network Connect Success, Jean is the queen of networking and does motivational and sales speaking nationwide. Marketing Department for Small Business, Leslie Lipps, helps us create all our beautiful e-marketing materials, I couldn’t do Arborsmith without her;). ADT Security Services, contact Mike Hogan, will help you evaluate your security even if you don’t buy anything from him, such a great guy, there to help, works with many professional ball players! Chuck Bourgeois owner of Progressive Energy Group, will save you money on your energy bills, at home or better at your place of business. The Chalet Nursery, for all your gardening supply needs in Wilmette, IL, contact: Jennifer Brennan. The Beaded Garden, Anne Flannery, Landscape Designer, great plantswoman and lovely lady with a great design sense. Cliff Miller owner of PC Miller, Landscape Artist and simply the most knowledgeable native plantsman on the North Shore. The Garden Consultants, owner David Migdal, landscape architect, beautiful work, second generation horticulturist, we have worked with David and his mother, Fern, almost our entire career. Photographer, Studio West, Jeff Mateer, owner, just beautiful portraits and commercial product photography. Possibility Place Nursery, owner Conner Shaw, absolutely best source for small trees and native plants. Nancy Lyons Hannick ASLA, NLH Design, a real landscape architect with over 25 years of experience on the North Shore, educated on the east coast with a flare for excellence. Urban Forestry Products, owners, Bruce and Erica Horrigan, Don’t burn your dead Ash tree make a family heirloom out of it, by letting UFP mill the wood and kiln dry it, Gil and his brothers created our beautiful dining table using a Black Walnut we harvested. PC Custom Woodwork, Peter Cichy, owner, an amazing cabinet maker and creator of all things from lumber...meticulous, conscientious and exacting! Architect, John Hershey of J Hershey Architecture, specializing in consultations with homeowner associations to get the repairs and maintenance done correctly the first time, saving you time and money in the long run! This is just a partial list: we really do probably “know someone” if you need a referral...ASK us, we all like to support good work and good people, so this is our “February Sharing the Love”.